Physical Installation: Attach Z-NET to your local network (LAN) with the supplied Ethernet cable and power the unit with the included power adapter. The LED indicator will blink red for about 20 seconds, then glow solid red. Accessing Z-NET: Using a PC, tablet or phone, open a browser and enter find.homeseer.com in the URL line. Click the Search... button. In most cases, you'll see two entries; one for your HomeTroller (or HS3 software system) and one for your Z-NET. There will be a third option if you are using the built-in Wi-Fi adapter, then you'll see a third entry (as shown below). Click the IP address hyperlink in the System column to access your Z-NET settings. Updating Z-NET: If a Z-NET update is available, click the Update button in the upper right hand corner (as shown below). The update should only take a moment to install. You can also rename the unit, if you like. If you're using more than 1 Z-NET, consider including the unit location in the name (First Floor Z-NET, for example). Be sure to submit your changes when done. IMPORTANT: As shipped, Z-NET will accept a router-assigned IP address using "DHCP". For most users, this is all that is required, as your HomeTroller or HS3 software system will not automatically discover Z-NET. You may now skip to X. However, if you wish to assign a persistent IP address to your Z-NET or if your Z-NET is on a different network than your HS3 system, complete the rest of the steps in this section. OPTIONAL: Setting a Persistent (static) IP Address: As shipped, Z-NET will accept a router-assigned IP address to Z-NET if desired. Use either of the following methods to accomplish this for your wired and/or wireless connections. USE Z-NET settings: Click the radio button for "Static-IP" and enter the static IP address of your choice. 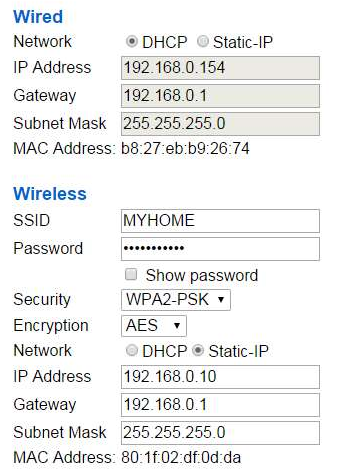 You should pick an address that is within your router's subnet but outside of the DHCP range. This will avoid conflicts with DHCP devices on the network. Save your settings and Z-NET will reboot. Use Router Address Reservation: Many routers include an IP address reservation feature that allows the router to assign specific IP addresses based on the MAC address of a device. To use this feature, leave the Z-NET network settings on DHCP. Enter the Mac address and the IP address into the router address reservation settings. Reboot your router. From this point on, your router will always assign the same IP address to Z-NET.